← Food Blogging in My Dreams Since 2006…. I start this post by advising all of you not to buy lumber during the rainiest, stormiest day… nay hour of the year in San Francisco. I have started another vegetable garden in our backyard. 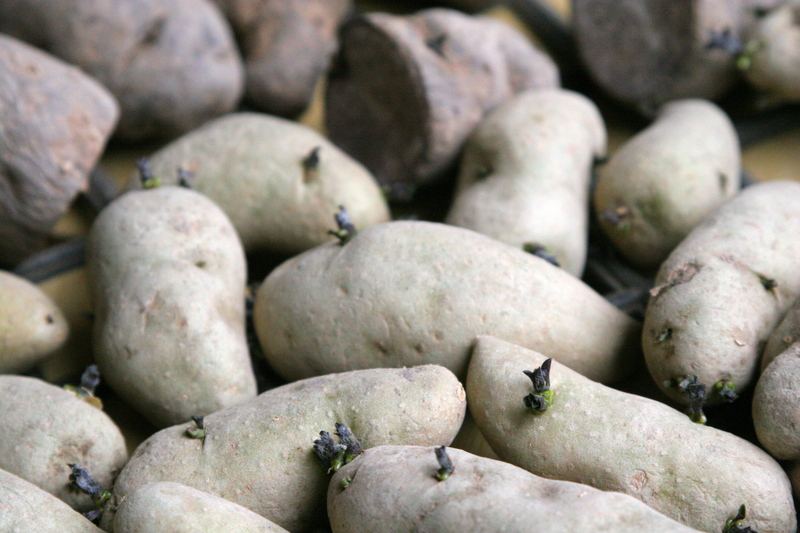 We already have a couple of raised beds with sprouts peeking out of the soil, but we (read: my father) need to build another vegetable box for my “chitting” fingerling potatoes (don’t laugh) and a couple of compost bins. We are planning on putting them together tomorrow so I brilliantly waited until the rainiest day of the past wet week. The odds were against me to begin with. Whenever I go to a hardware store or Home Depot I try to really know what I need so I don’t have to be that gal who always asks for help. However, this time I came in dripping wet with an equally wet little toddler. I accepted assistance getting down lumber only to realize that the ten foot long 2”x12” boards were not going to fit in my van. I returned back to the front with my toddler who was dancing to “Kung Fu Fighting” from Home Depot’s intercom, and yes, asked them to help me put them back and exchange them for eight foot long boards. I paid, and we were getting ready to load the car when suddenly an apocalyptic amount of rain began to fall. So my toddler, and two big guys were absolutely drenched in freezing rain while awkwardly maneuvering stained (ugh!) pressure treated planks of wood around car seats, a stroller, and a bike. I arrived home more soaked than if I had simply jumped into a swimming pool. Strangely, before I stripped down and took a hot shower, the thing I most craved was a hot, buttered piece of ciabatta toast. You cannot plan for apocalyptic rain (especially when it has been raining for the last eight days). You can, however, plan for ciabatta bread. 2. Do you have flour, water, salt, and yeast in your house? Even better. 3. Do you have a mixer? Great, you can make this! The secret to incredibly flavorful, heady ciabatta bread is to prepare at least 24 hours ahead of time. You simply mix a small quantity of flour, yeast, and water and leave it alone. This is called a “biga” in Italian. I usually start it in the evening, 36 hours before I plan to cook the bread. Two mornings later, I add the rest of the yeast, flour, salt, and water and then mix the heck out of it in my best friend, my Kitchen Aid. Letting the “biga” really take it’s time allows a slower fermentation process for the yeast, and in turn encourages the development of good, tasty bacteria that add a fabulous, complex flavor to your bread. It is that haunting taste in your mouth after you have actually swallowed a mouthful of bread. Tangy. Almost sour, but not quite. With a dab of butter and a sprinkle of sea salt, it is transcendent. My love of ciabatta bread certainly stems from my mother. It is her favorite bread, but she does not prefer it still warm from the oven, but rather because it makes perfect toast. 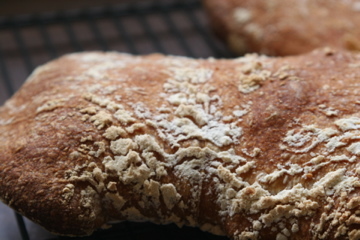 Ciabatta bread elevates the most basic ingredients of flour and water to something magical. My mom baked quite a bit when I and my sisters were little. I feel like a bit of a cheater giving out this recipe because, contrary to the effort she put in kneading bread, the mixer makes this recipe a piece of cake. In fact, I confess that with my newfound passion of baking bread that I have not bought a loaf of bread in over three months. The warm, yeasty smell it imparts to your kitchen alone is worth taking the trouble. 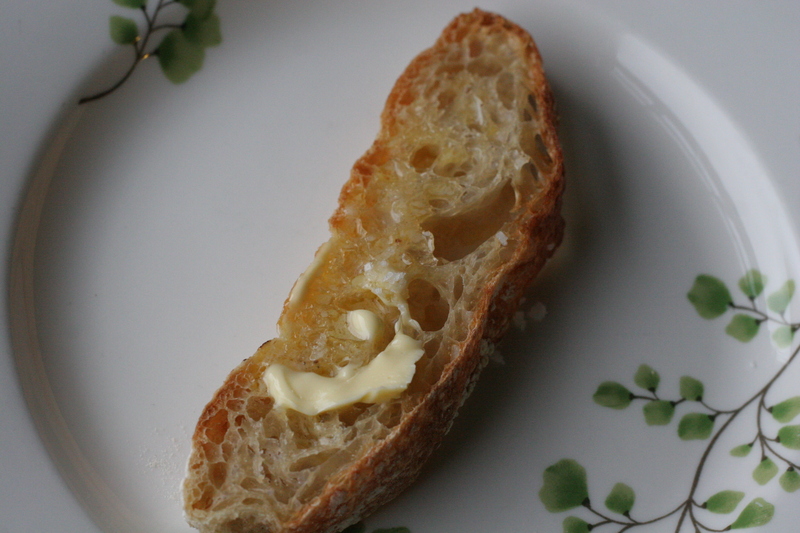 With any leftover bread you can make more amazing things. Look out for an upcoming post on a favorite open-faced sandwich (“tartine”) that I make over here. Or use slices to make a crunchy-on-the-top, custardy-in-the-middle bread pudding. You could go purchase lumber in the pouring rain, or you could go begin your biga tonight! Please report back your success stories! Head notes: Make sure to start this at least 24 hours ahead of time for the maximum flavor development. Other helpful things to have around include a scale, parchment paper, ice cubes, and a pizza stone. The scale is really great because flour weights vary so much. I always bake bread with my scale to have precise control. Also, you can halve the recipe if you want, but why would you only want one loaf? 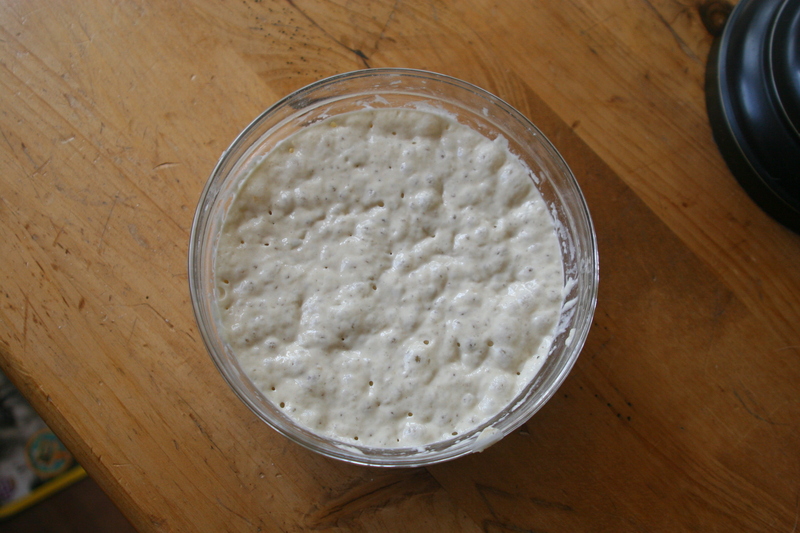 Biga, prepared from 24 plus hours earlier. 1. Make the biga. Mix all the ingredients for the biga in a large bowl. Cover with plastic and leave at room temperature for at least 6 hours (if warm where you live) or up to 24 hours (if cooler, like here in San Francisco right now). It should triple in size and be filled with bubbles. 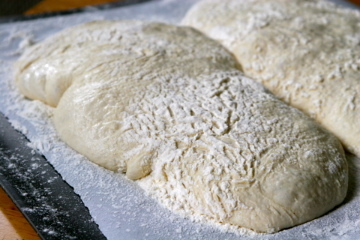 Refrigerate (up to 3 days before baking) until ready to use, but make sure to take it out at least an hour before preparing the actual dough. The biga has to come to room temperature. 2. Oil a very large bowl. The dough is going to triple in size. 3. When the biga is ready, mix your dough in the mixer bowl. First whisk the flour and yeast together. Then whisk in the salt and add the biga and the room temperature water. 4. Turn your mixer on with the paddle attachment. Mix on low until the dough is moistened. 5. Turn up the mixer to medium-high speed for 3 or 4 minutes. The dough will be very moist, almost like pancake batter. After a while, you will see strands of gluten develop and pull away from the sides of the mixer. Lower the mixing speed to medium and beat for another 2 to 3 minutes.The dough will pull away from the sides of the bowl. (If not, add another tablespoon or two of flour very slowly, but if you measure everything with a scale, you won’t have this problem). 6. Turn off the machine and detach the paddle. Using the paddle from the mixer, lift the entire dough into the prepared, oiled bowl. It should all just come up in one long, stretchy lump. (Otherwise just scrape it in.) Cover with plastic wrap or a kitchen towel. 7. Let rise until tripled. In my kitchen at about 65 degrees it takes about two and a half hours, but it could take only 1 1/4 hours too. 8. Shape the dough and final rise. Generously dust flour onto a surface in the shape of a rectangle. Carefully and gently scrape half of the dough out (I sometimes use scissors to just cut it off once half has spilled out.) Dust or sift more flour on top. Use your hands to gently push in the sides until it is more rectangular in shape. Remember this is a rustic bread (“ciabatta” means slipper in Italian) so an uneven shape is perfect. 10. On a rimless cookie sheet place a sheet of parchment and dust lightly with flour. Lift the dough and flip (invert) it onto the sheet so top becomes the bottom. Make room on the other side of the sheet for the other loaf of bread. This is a little tricky, but don’t worry if it has a funky shape. It looks beautiful after cooking. Repeat with the rest of the dough to make a second loaf. Sift a lot of flour on top (so it doesn’t stick to the plastic wrap). Cover loosely with plastic wrap and let rise until it is 1 to 1 1/2 inches high, about 2 hours. 11. An hour before baking, put the baking stone (or baking sheet) into the oven on the lowest rack and preheat to 475 degrees. Place a little cast iron skillet or brownie pan underneath it on the floor of the oven to preheat with the stone. 12. Prepare 1/2 cup of ice cubes. Open the oven and slide the parchment off the baking tray and directly onto the hot baking stone or sheet. Put the ice cubes into the iron skillet/brownie pan and quickly shut the door. After 5 minutes turn the oven down to 450 degrees and bake ten more minutes. Quickly open the door and pull out the parchment (for a crispier bottom) and rotate both loaves 180 degrees for even cooking. Cook 10 more minutes, or until the top is deep golden brown. 13. For a crispier crust, at the end of cooking turn off the oven and leave the loaves for 5 minutes with the door ajar (put a covered wooden spoon handle in to prop the door). 14. Take out and let cool on a wire rack. When absolutely cool, brush extra flour off of the surfaces, slice, and enjoy with your favorite butter (and a sprinkle of sea salt). As I mentioned, it makes the best toast, with or without jam. Enjoy! This entry was posted in Breads and tagged baking, ciabatta bread, Ciabatta recipe. Bookmark the permalink. Simply stunning! I’ll report back on my efforts, and I eagerly await the tartine sandwich post! Can’t wait to try this! Thanks for the detailed instructions.